Killamarsh Secondary Modern School July 1958. See note below. Photo courtesy of David Nicholls. 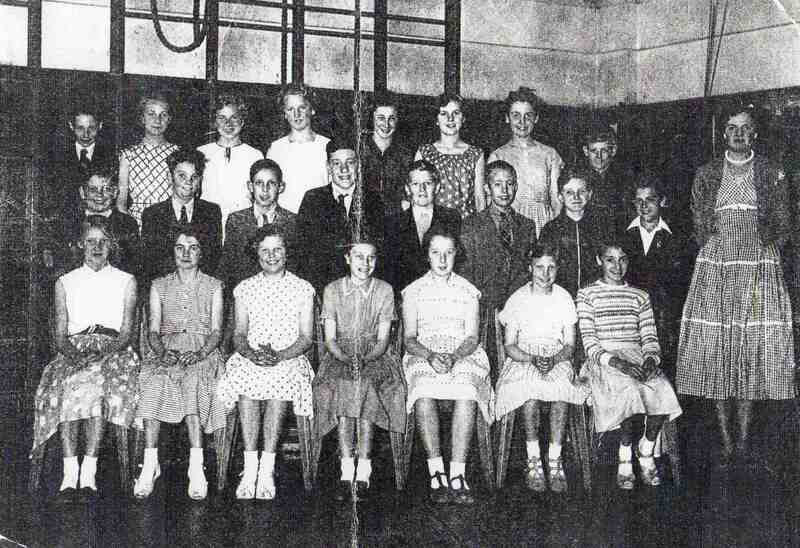 My sister rang from Australia today Jennifer Hazzard (DOPSON), to see if I had looked at Killamarsh Web site, I have now looked and found myself on a photo from the Killamarsh secondary school 1958. Thankyou to the person who sent it in great memories of the people I went to school with. I will keep on looking to see if I can find my brothers and sisters in these photo’s. Back row: David Nicholls, Joan Hallam, ? ?, Pauline Hardwick, Dorothy Beech, Pat Smith, Sheila Dumbleton, Alan Flint. Middle row: John Mallender, David Thompson, Gary Bright, Dereck Milner, Tony Beedham, Clive Storer, Michael Barnes. Front row: Christine Brookfield, Eileen Dopson, Marjorie Roper, Norma Loy, Jennifer Davies, Ann Plant, Pat Howson.